Protective factors are strengths and supports that allow children to succeed despite many risk factors (e.g. being in poverty or having parents with substance abuse problems). Three key factors offered by schools that protect young children and promote their resilience are 1) caring relationships, 2) high expectations and academic standards, and 3) opportunities for participation and contribution. For children aged 5-12 years, the school's role in supporting protective factors in children cannot be understated. Through daily contact, schools help shape children's beliefs in their own abilities to achieve, and can help children develop and strengthen protective factors, which promote their resilience when exposed to adverse events, and even may prevent problems from occurring in the future. Caring and supportive relationships in schools can help prevent a host of negative outcomes for children, including behavior problems. When students feel supported and cared for in their school environments, they are less likely to abuse substances, to become involved in violence, and to participate in other problematic behaviors. These students are also more likely to develop positive attitudes toward themselves and prosocial attitudes and behaviors toward others. "Much of the available research shows that supportive schools foster these positive outcomes by promoting students' sense of 'connectedness', 'belongingness', or 'community' during the school day." High expectations for students and rigorous academic standards lead to higher academic achievement. High expectations for students – and necessary supports students need to reach those expectations – lead to high student achievement. Setting these expectations up during early elementary school can chart the course for students' future academic path. Expectations of success contribute to positive academic outcomes, as well as students' self-efficacy, self-awareness, and goals (California Department of Education, 2005). Teachers who set high expectations for students, track students' progress in reaching those expectations, provide ongoing monitoring and support, and adjust goals as needed, help students succeed. Moreover, in order to be successful, community building efforts in schools may need to be combined with "academic press" – a strong emphasis on academic achievement. Opportunities for participation and contribution in the learning process lead to positive outcomes for students. Students do better when they have opportunities to participate in and contribute to their own learning. "Research has shown that motivation is related to whether or not students have opportunities to be autonomous and to make important academic choices. Having choices allows children to feel that they have control or ownership over their own learning. This, in turn, helps them develop a sense of responsibility and self-motivation. 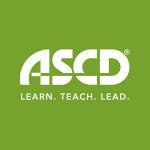 When students feel a sense of ownership, they want to engage in academic tasks and persist in learning." McCombs, B. (2012). Developing Responsible and Autonomous Learners: A Key to Motivating Students. American Psychological Association. Retrieved from: http://www.apa.org/education/k12/learners.aspx?item=1. Schaps, E. (2005). The role of supportive school environments in promoting academic success. In: Getting Results: Update 5, Student Health, Supportive Schools, and Academic Success. Sacramento, CA: CDE Press. Hawkins, J. D., Catalano, R. F., Kosterman, R., Abbott, R., & Hill, K. G. (1999). Preventing adolescent health-risk behaviors by strengthening protection during childhood. Archives of Pediatric and Adolescent Medicine, 153, 226–234. Battistich, V., & Hom, A. (1997). The relationship between students' sense of their school as a community and their involvement in problem behaviors. American Journal of Public Health, 87(12), 1997–2001. Resnick, M. D., Bearman, P. S., Blum, R. W., Bauman, K. E., Harris, K. M., Jones, J., Tabor, J., Beuhring, T., Sieving, R. E., Shew, M., Ireland, M., Bearinger, L. H., & Udry, J. R. (1997). Protecting adolescents from harm: Findings from the National Longitudinal Study on Adolescent Health. Journal of the American Medical Association, 278(10), 823–832. Baumeister, R., & Leary, M. (1995). The need to belong: Desire for interpersonal attachments as a fundamental human motivation. Psychological Bulletin, 117(3), 497–529. Schaps, E., Battistich, V., & Solomon, D. (1997). School as a caring community: A key to character. In A. Molnar (Ed. ), The construction of children's character. Ninety-sixth yearbook of the National Society for the Study of Education (pp. 127–139). Chicago: National Society for the Study of Education. Lists a number of risk and protective factors that have been identified in relation to child abuse and neglect. Suggests specific actions that school personnel can take to promote protective factors and build resilience in children and families. Addresses the role of the family and the school in promoting student engagement, essential characteristics of schools that motivate student learning, promising practices that foster student motivation, and the potential unintended consequences of high-stakes testing for student engagement. 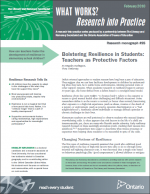 Provides an overview of research in the area of student resilience, particularly teachers' role in creating an environment where students can develop the ability to overcome challenges. Reviews key protective factors and seven strategies teachers can employ in creating environments that foster resilience in students. Students who feel supported by their parents are less likely to experience emotional distress, practice unhealthy eating behaviors, consider or attempt suicide, or disengage from school and learning.